PRESS PLAY TO VIEW THE VIDEO. 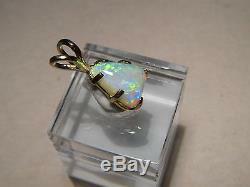 Solid Australian crystal Opal set in a solid 14 kt gold Setting. 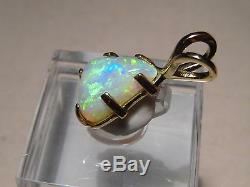 This Opal from Coober Pedy South Australia is 100% Natural and not a doublet or triplet! 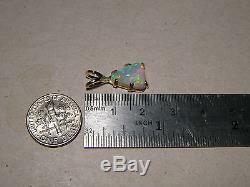 OPAL WEIGHT: 2.5 carats. 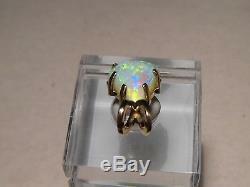 OPAL SIZE: 11 x 9.5 x 4 mm. BODY TONE: N9 crystal opal. PATTERN: Floral / Large Patch. COLORS: Lime green and some Blue. 1.5 grams 14 k yellow. BRIGHTNESS IS RATED ON A ONE TO FIVE SCALE AS. 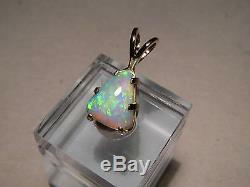 Opal has Color but is Fairly Dull. 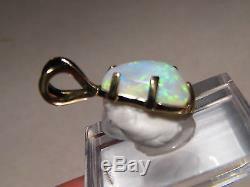 I have been making Opal Jewelry for 22 years and stand behind all my work. 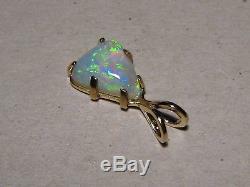 The item "2.50 ct Australian Gem Opal Pendant solid 14 kt yellow gold" is in sale since Tuesday, November 22, 2016. 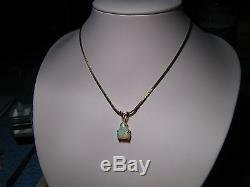 This item is in the category "Jewelry & Watches\Fine Jewelry\Fine Necklaces & Pendants\Gemstone". The seller is "flashopal" and is located in Victoria Point, QLD.